My friend Julie shared a link to this article on Facebook today and I felt compelled to share it. I feel it is my responsibility as a reader, a writer, and a woman to make you all aware that there is misogynist pig lurking on our bookshelves and we have given him the Nobel Prize! Nobel laureate says there is no female author whom he considers his equal. VS Naipaul, no stranger to literary spats and rows, has done it again. This time, the winner of the Nobel prize for literature has lashed out at female authors, saying there is no woman writer whom he considers his equal – and singling out Jane Austen for particular criticism. In an interview at the Royal Geographic Society on Tuesday about his career, Naipaul, who has been described as the “greatest living writer of English prose”, was asked if he considered any woman writer his literary match. He replied: “I don’t think so.” Of Austen he said he “couldn’t possibly share her sentimental ambitions, her sentimental sense of the world”. The author, who was born in Trinidad, said this was because of women’s “sentimentality, the narrow view of the world”. “And inevitably for a woman, she is not a complete master of a house, so that comes over in her writing too,” he said. So, sentimentality gives you a narrow view of the world and because a woman is “not a complete master of a house,” she can’t be a great writer? Who the hell does he think he is?!? Not the complete master of a house! Has he ever witnessed the life of a working mother?? Modern mothers are the effing MASTERS of the house!!!!! We do everything! And we find time to write too. And as far as sentimentality goes, eff you man! How can you possibly gain a complete view of the world without sentimentality? 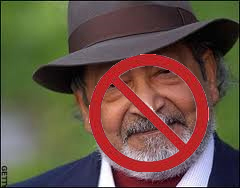 SAY NO TO MISOGYNI, SAY NO TO VS NAIPAUL!